Netherlands-based Centurian has been away for a while -- eleven long years. While their first two albums of thrash-influenced death metal were very solid, recalling early Morbid Angel, it seemed that we weren't destined to hear from them again. 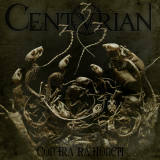 Fortunately for us, their new album, Contra Rationem, shows that not only are they back, but they're better than ever. The album is a tight, accomplished measure of brutality and technical excellence that has been done before, but is not at all unwelcome. The first track clearly displays what we're in store for, setting the tone with a fierce blastbeat attack and a technically accomplished riff -- but in my opinion, this was actually the weakest song on the album, since it had little in the way of lead and the repeated cymbal use made it sound staticy in parts. However, the next three songs quickly remedy the first's minor flaws. They explode with high-speed, often tremolo-picked riffs, enjoyable soloing of which one wishes there was more, and a driving beat that quickly invites headbanging. I couldn't help but think that Crown of Bones, especially, sounded like it would be a great crowdpleaser live. The Will of the Torch also stood out for me, starting with a similar rhythm to the first track, but with better drumming and melody, and a quick switch in the middle to a ferocious thrashing bridge. The biggest weakness of music like this is that the field has already been dominated by former greats who have gone on to different things and sometimes even different styles, but even then the genre still has room for bands that can innovate -- they just have a higher bar to surmount. Centurian accomplishes this well, but their final songs were the most interesting to me out of all of them: Both Damnatio Memoriae and Adversus changed up their normal blastbeat-driven attack for a bit of a slower, more varied sound, and even some spoken-word parts in between getting your ears pounded. Their drumming, guitar, and bass are precise but don't sound too mechanized, and the production on the album seems to reflect this, sounding good while avoiding slickness. The bottom line on this album is that if you were a fan of high-speed death metal in the vein of Nile, or what Morbid Angel used to do on a regular basis, you're probably going to enjoy this. The departure of former drummer Wim van der Valk hasn't hurt the band at all, and it's clear that with Contra Rationem, Centurian has improved on what already was an excellent start.